There’s a lot written on the value of appreciation, and the importance of recognizing your employees and leadership for the work they are doing. In fact giving appreciation is not only good for the person who receives it, it’s also been found to be very impactful on improving the well-being of the person who provides it. It would be an understatement to suggest we provide adequate praise and recognition to our employees. The question is how impactful and important is it to provide this? Is there something as important or impactful that provides more employee performance? According to a Harvard Business Review article, What Really Motivates Workers the top motivator for workers is not recognition, rather its progress. Does that adjust your thinking at all? Does it suggest the value of Strategic Discipline can be more impactful on your business than you might have imagined? Strategic Discipline involves choosing priorities, (individual and company),determining metrics (developing dashboards to measure progress) and then developing meeting rhythms to regularly monitor the advancement of your team toward these metrics and priorities. If you have some reservations about whether or not progress is that important you may wish to read What really motivates workers? Don’t believe the Harvard Business Review. The author suggests that instead of progress, to really keep a team passionate and focused you need more than a satisfied team, you also need a team that’s completely focussed on its goals. Clarity of purpose. That’s where good ol’ fashioned incentives can work wonders. No argument here. That’s exactly what identifying priorities, developing metrics (and dashboards to measure progress) and meeting rhythms are intended to achieve. 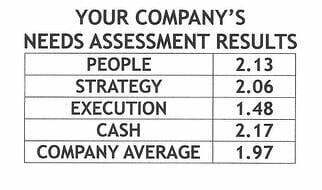 Clarity of purpose is one of the keys to Organizational Health that Patrick Lencioni identifies in The Advantage. How does your leadership team and employees feel about the progress they make each day? I love quotes, and many years ago I had the good fortune to meet Ralph C. Stayer, author of The Flight of the Buffalo in person. He provided me with a lesson on employee motivation. There’s much to learn from this and I suggest when considering how to get improved performance from your people you remember the importance of clarity of purpose, progress and just as important the value of Pearsons Law.